There was such interest in Clybourne Park that the Ensemble Theatre production sold out before opening so two performances in Chatswood have been added. Written by American actor-playwright Bruce Norris, the play arrives in Sydney trailing numerous awards including the 2011 Pulitzer Prize for Drama, the 2012 Tony Award for Best Play and the 2011 Olivier Award for Best New Play. Expectations were therefore high – and the Ensemble production more than meets them. The pithy drama straddles 50 years in a Chicago suburb. It begins in 1959. A clearly unhappy couple – the angry, taciturn Russ (Richard Sydenham) and his over-cheery wife Bev (Wendy Strehlow) – is packing up their home with the help of their black maid Francine (Paula Arundell). Their local preacher (Thomas Campbell) arrives, clearly hoping to have a meaningful conversation with Russ, followed not long after by a neighbour called Karl (Nathan Lovejoy) with his deaf, pregnant wife Betsy (Briallen Clarke). Politely outraged that they have sold the property to a “coloured” family at a knock-down price (for reasons revealed later), Karl tries to convince them to change their mind, his appalling bigotry expressed in the nicest way possible. When Francine’s husband Albert (Cleave Williams) arrives to pick her up, his attempt to help Russ becomes excruciatingly awkward. The second act is set in 2009. A white couple (Lovejoy and Clarke) has bought the run-down house in the now predominantly Afro-American suburb and wants to rebuild. This time, there are objections from a young, black woman (Arundell) who wants the history of the area to be respected. 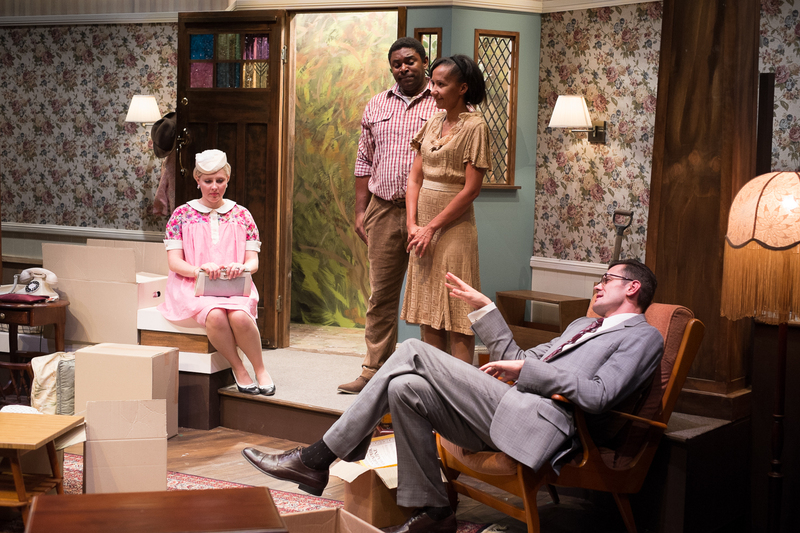 Clybourne Park is a provocative play with some truly cringe-making moments, including several rancid jokes. But it is also very funny and sad as it tackles racism, political correctness and real estate, while weaving in grief and post-traumatic stress disorder too. You’re aware that the play’s neat structure – which has the cast playing two different sets of characters across the two time-frames, some of them related – is well-crafted if not contrived in its balanced halves and set-piece debates. However, it’s so cleverly done and the writing so good that it works. Tanya Goldberg directs a terrific production on a set by Tobhiyah Stone Feller that manages to make the stage look much bigger than usual (a feat that Lauren Peters has pulled off with equal flair for The Drowsy Chaperone currently playing at the tiny Hayes Theatre Co). The way the house is transformed into a graffiti-covered state of disrepair during the interval is very cleverly done. Goldberg has elicited uniformly strong, utterly truthful performances from her excellent cast who work together as a well-oiled ensemble. Clybourne Park could easily be set in Sydney, where right now there are plans for public housing in prime, inner-city locations to be sold off by the NSW State Government, despite the long-standing history of the area. It’s a thought-provoking play that has you squirming at times and underlines with discomforting power that attitudes haven’t changed anywhere near as much as we’d like to think.